While our blog contains articles, we use Facebook to share quick ideas on travel, photography, and small business marketing. Another advantage of connecting with us on Facebook is you can easily share news and updates with your friends. Save time by clicking Share and quickly passing important information to your friends. 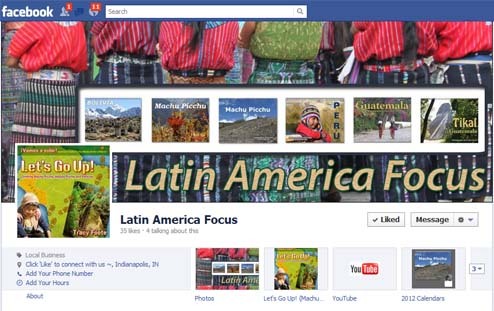 Click “Like” to keep receive updates on blog posts, videos, photos, and news of South and Central America. When you click “Like” on our Facebook page and continue to interact with us, Facebook will send notices to you in the form of a news-feed. It’s an easy way to keep up-to-date on Latin America interests. posting your own update onto our page ~ yes, we like to hear from you!